Maybe you’re a young couple still in college, or maybe money is tight — whatever it may be, there are plenty of reasons why people are wanting to have a budget-friendly wedding. A wedding is an exciting event in our lives and one that we will remember for a long time. Unfortunately, weddings are also expensive. Did you know that, according to a study done in the United States, the average wedding expense is $26,720? Plus, on average, couples spend between $20,040 and $33,400! As crazy as it may seem it is, unfortunately, true. One of the common concerns engaged couples have is not having enough cash to pull off their dream wedding. Wedding costs do quickly add up and can become overwhelming expensive. However, there are ways to have the perfect day without burning through all of your savings! Check out some great tips that you can follow throughout the wedding planning stage to trim costs while still having the beautiful and perfect wedding of your dreams! It’s no secret that cost of getting married can change depending on the time of year that you set the date for. Summer weekend weddings are generally always more expensive because they’re warm, sunny, and rain is not a big risk. On the other side of things, weekdays during the cold, wet, and windy seasons are cheaper as they aren’t as popular. Long weekends are the jackpot for wedding dates, and tons of couples will be hoping to secure — if they haven’t already — that weekend opening that comes with an extra day that allows their guest to relax or have enough time for travel. When you set the date outside of summer, you are choosing a less expensive time but are risking the chance of rain or other inconvenient weather conditions. However, if you want to have a less expensive date, and to avoid the rain, shoot for tying the knot in the late spring. You’ll still get the amazing features of the spring season but with a better chance of avoiding the rain! Want to save even more? If you’re looking for the cheapest time to get married, get married midweek, as you can end up saving a lot on everything, from venues to suppliers. Suppliers and venues will quickly book on weekends, but midweek events aren’t as common, so prices will be more budget-friendly. The location of the wedding is one of the biggest decisions you have to make during the wedding planning process. The venue really is the scene-setter for the day, but there are plenty of ways to save on the rental and venue costs. Some venues will offer extras that can be included, like decorations, menus, DJ’s, food, and more. Opting for these additional amenities can end up saving you the time and money it would take to get everything yourself or bring in outside vendors. A simple way to save some cash in this process is to have the wedding and the reception in the same area. Although, a lot of the time, you will see the wedding ceremony and reception at two different venues, having it all at once place can make a large difference financially as you are paying far less due to only having to rent one venue. In addition, having the ceremony and reception in the same location saves on transportation costs and is less of a hassle for guests. If you are concerned that the venue or church is too big or is looking a bit sparse, you can strategically place decorations and flowers. If you are decorating a church, decorate every few pews. If you’re decorating the reception venue, consider placing smaller bouquets and decorations on each one. The style and choice of food you have at your wedding can surprisingly fluctuate costs. Having a multiple-course, sit-down dinner will be significantly more expensive than a budget-friendly choice, like a self-serve buffet meal. Some couples even choose to have their guest be responsible for getting their own meal in between the ceremony and reception — only taking the bridal party out for a special meal — and offer finger foods and appetizers once they arrive at the reception location. If you do decide to have a sit-down meal, you can always get rid of some courses to save money. However, the popular choice that will save you some cash is having a buffet-style meal. Guests are responsible for getting their own food, which is restocked when empty. This will save you from having to pay a serving staff too. Or, a popular budget-friendly option for dinner is having something unique and informal, like a pig roast. Dessert is an important part of the wedding! Not having dessert may raise some eyebrows, but when you do serve it, there’s the chance of overkill and wasting money. Usually, the most expensive dessert is the wedding cake. The wedding cake is one of the most symbolic parts of a reception; however, when you chose to get a large wedding cake that will feed your guests, it can easily be out of your budget. Instead of ditching this important piece, choose to have a smaller, more personal wedding cake. Then, add individual desserts, like cookies and cupcakes, into the mix, and you’ll have satisfied friends and family. Taking this route will still allow you to capture a photo of the cake-cutting experience while saving a decent amount of money. Having pop, water, and lemonade is a great way to save a ton of money on wedding costs. Alcohol is one of the biggest expenses you will have for a wedding; however, it does make the weddings fun and allows guests to enjoy themselves. If you don’t want to ditch the alcohol altogether, get rid of the spirits and liquors and opt for having beer and wine only. Both beer and wine are significantly cheaper than spirits and will still be enjoyed by guests. This simple switch alone can save you hundreds of dollars. Wedding rings are simply gorgeous. The rings symbolize beauty, commitment, and eternity. Unfortunately, engagement rings and wedding rings can be extremely expensive. According to a report by Jewelers of America, in a year, couples spent an average of $4,000 on an engagement ring. You can save money by getting smaller, not-as-nice rings but who wants to do that for an item that symbolizes love and commitment between one another? Couples can save on engagement rings and wedding bands by choosing a moissanite ring instead of an expensive, diamond ring. Moissanite is a rare mineral that is created in a lab, looking almost identical to diamonds. Moissanite stones are some of most beautiful colorless gems and hold the same beauty, size, and clarity of the, more expensive, natural diamonds. By choosing to purchase inexpensive engagement rings, like a moissanite ring, you’ll end up saving a lot of money. Looking for affordable engagement rings? Wedding rings are a big cost of weddings. Instead of opting to buy an expensive diamond and choosing a diamond ring alternate, like Moissanite, will save you a lot of money that can be used towards other costs. 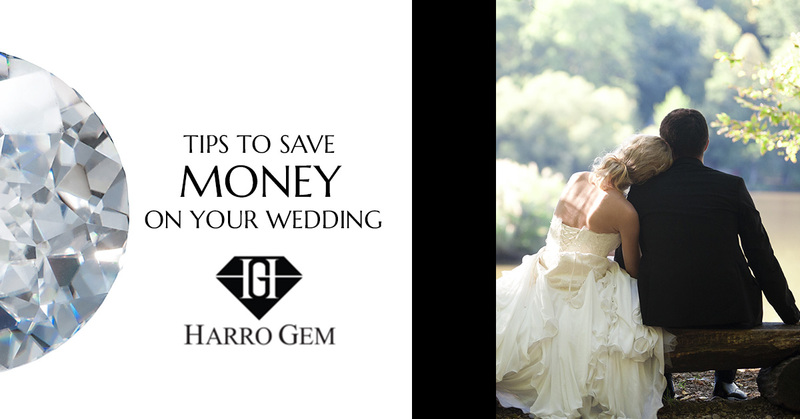 You can find a great selection of moissanite engagement rings and wedding bands by shopping online at Harro Gem! Harro Gem is proud to carry some of the whitest, eye-catching moissanite stones that are available on the market. See for yourself, shop our affordable wedding rings!